Here is a list of the Best Free Timeline Maker Software for Windows. Using these timeline generators you can easily create beautiful timelines for free. Making timeline with these freeware is quite simple and easy and requires no extra effort on your part. You can add any number of events and provide detailed information about events. Different details option comprise of time, date, duration, details, description, etc. in order to make an informative timeline. Timelines can be created for as long as you want. You can also add different items to your timeline, such as: images, videos, sounds, cliparts, etc. to get the results as per your choice. You can choose to view timelines in 3D too. 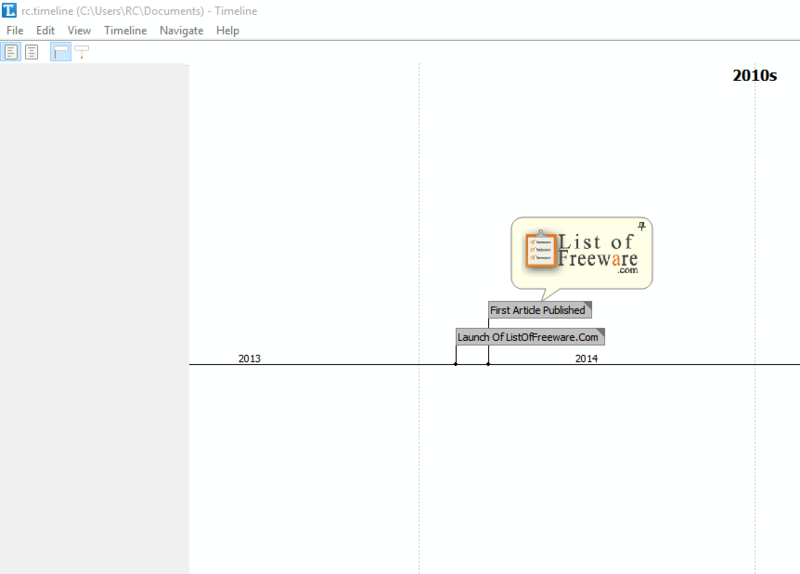 Timelines created from these freeware can be taken as printout or exported as PDF, XPS, DOC, PPT, etc. Go through the following list of carefully chosen Timeline maker software to select the one which suits you the best. You will also get to know how to make a timeline with these software. Out of the list of these timeline maker software, I like Timeline Studio the most. You can easily create a timeline using these freeware and add events, edit events, control event positioning, change color, change background, etc. It can also import data from Excel and CSV files. Timelines can be exported as JPG, BMP, export to Excel, or publish to web through this Timeline maker software. You can also check out the list of Best Free Time Management Software, Best Free Project Management Software, and Best Free Countdown Timer software. Timeline Studio is a simple timeline maker freeware that can be used to make timelines for free. This timeline generator can be used to add events, edit events, control event positioning, change colors, background, and formatting options. Create a timeline and set time range as per your choice or choose from the options: 20th Century-21st century, historical, ancient history, day/hour/minute, step/distance, etc. Add the events in the next window that appears. Import data from Excel, CSV, or timeline files if required. Finally, the timeline is generated. Make edits to the timeline as required and export it in required format. This timeline maker software provides you with certain editing options and lets you set timeline units, axis text, axis text position, etc. You can also choose to add background image, remove background image, edit event, add event, add groups, shift events, etc. If required in the timeline password protection option can also be enabled. 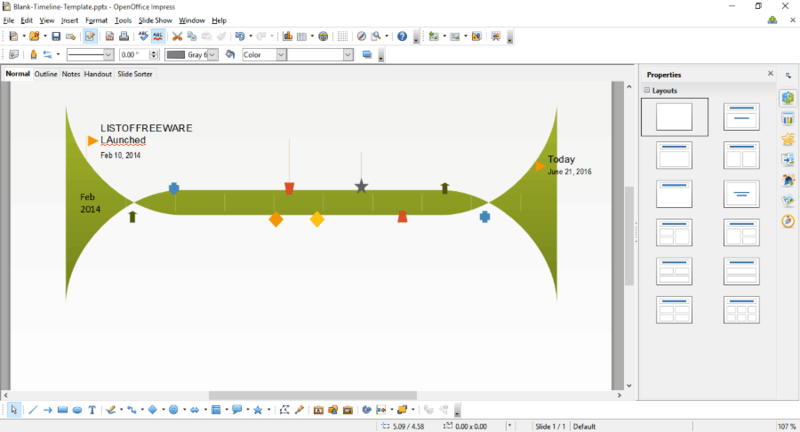 Timeline Studio provides several display and view options, that prove to be quite a useful feature for timeline maker. Options like bay width, bay offset, event snap, minimum bar height, bar color, bar outline color, event font, and bar width let you change other visible aspects of the timeline. This free timeline maker software can save Timeline as TML file. Options are also available to copy images to clipboard, save as JPG, BMP, export to Excel, or publish to web. If required, a printout of the timeline can also be taken. Microsoft Office though not being a freeware is a widely used Office application. It is available on most systems, thus is included here. Microsoft Office can be used as timeline maker software with programs like Microsoft Excel, Microsoft Word and Microsoft PowerPoint. 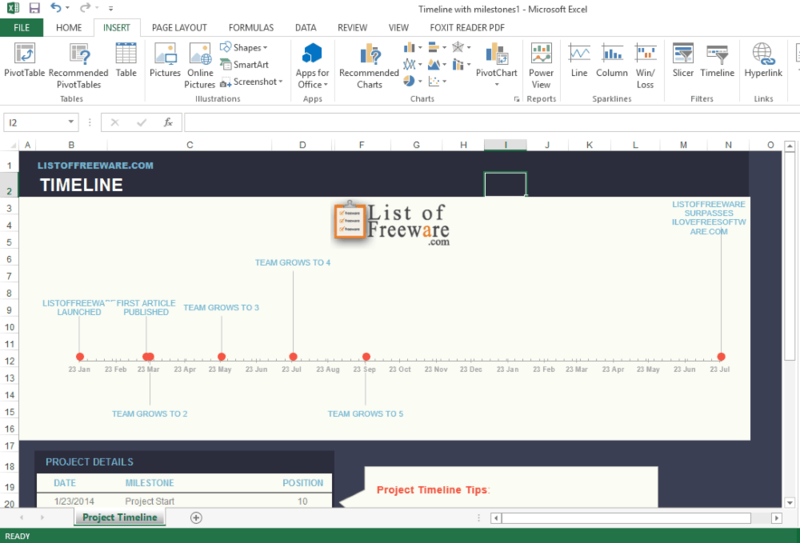 There are a number of timeline templates available for Microsoft Excel, Microsoft Word, and Microsoft PowerPoint, that can ease your task of creating timelines. Open any Microsoft Office application from the options of Microsoft Word, Microsoft PowerPoint, or Microsoft Excel. Search for timeline template, and choose the timeline template which suits you best. Download and open the timeline template. You can also download timeline template from some external websites as well. Based on the timeline template, add different items to the timeline. Each timeline template encompasses different feature and provide you with different tools to make timeline. Based on the application you are working on you are also provided with different timeline creator tools. Add entries, time, date, duration, details, etc. to the timeline. Various elements like tables, pictures, shapes, smart art, charts, graphs, etc. can be added. You can also choose to add certain animation and transition effects in case you are working on Microsoft PowerPoint. Pictures, audio, video, WordArt, etc. can be added to the timeline irrespective of the software you are using. In case you want to add some extra functionalities to Microsoft PowerPoint and make the task of timeline creation easier, it can be achieved using Office Timeline. 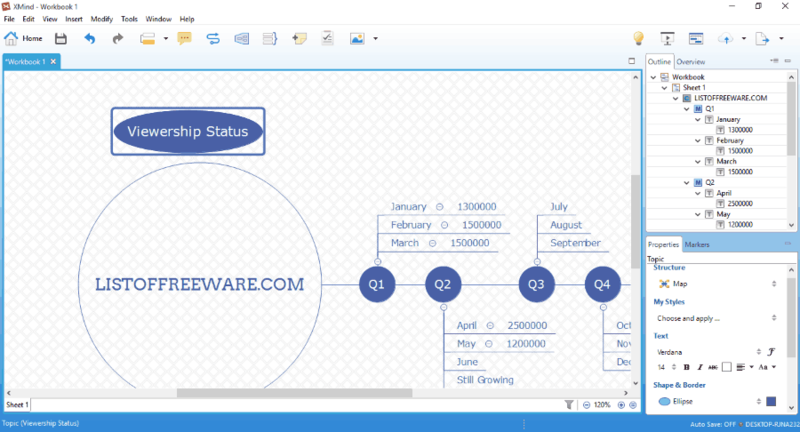 Office Timeline is available in a freeware version. The freeware version of Office Timeline is a good timeline maker software. In order to install it you need to have Microsoft PowerPoint installed on your system. It adds a Ribbon menu of Office Timeline Free to ease your task while you create a timeline. 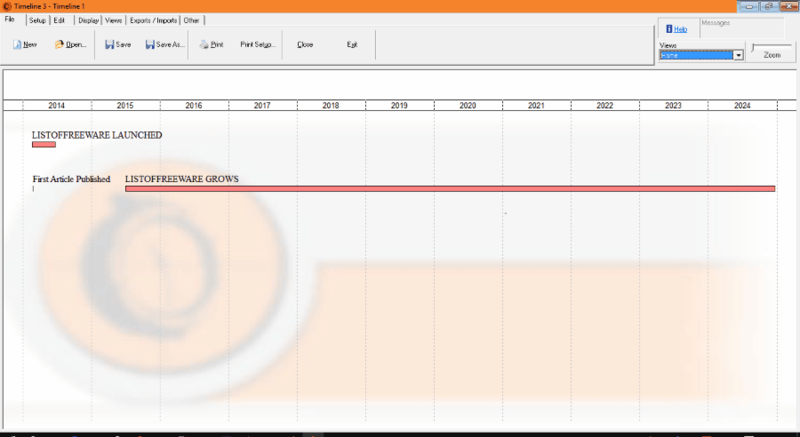 Timelines can also be created by importing data from Excel. 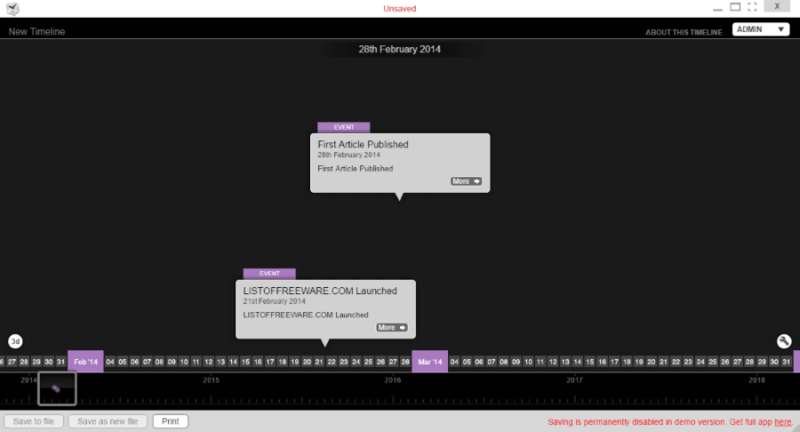 A number of free timeline templates are provided along with this software. In order to create a timeline, select any free template and customize it as per your need. A whole different timeline creator interface lets you manage timeline and create a timeline quite easily. You can also make use of Microsoft PowerPoint features in order to customize your timeline. Option to add milestones, tasks, style, and scale options are also available. Milestone, timeband, etc. options can be changed to change the look and feel of timeline. Timeline position, shapes, size, position option is also available for easy access of the timeline. Certain PowerPoint options can be put to use to add images, media, shapes, SmartArt, WordArt, charts, design, transition, animation, etc. Finally option can be chosen to save the timeline locally or on cloud. Cloud saving option is not available on older versions of Office. Locally timeline files can be saved as PPTX, PPTM, PPT, PDF, XPS, POTX, POTM, POT, THMX, PPSX, PPSM, PPS, PPAM, PPA, XML, MP4, WMV, GIF, JPEG, PNG, TIFF, BMP, WMF, EMF, RTF, PPTX, ODP, XLSX, XLSM, XLSB, XLS, MHT, MHTML, HTM, HTML, XLTX, XLTM, XLT, TXT, CSV, DIF, SLK, XLAM, XLA, etc. TikiToki Desktop Demo is a free Chrome Extension. It is a free version of the TikiToki Desktop. It is a timeline maker software. In the Demo version, there is only a single limitation that you cannot save the timeline, but you can choose the option to take a printout of timeline, save it as PDF, or export it as CSV. It can also be used to open TKI files. The best part of this freeware is that it provides 3D options to view timelines. Spans and feeds can also be added to the timeline if required. Open TikiToki Desktop Demo and choose to create a new timeline. In case you have any TKI files, you can also open it and edit it. Set the zoom option and add timeline details, like: title, timeline duration, intro, about, etc. Add intro image, background image, and set zoom options as required. Create stories and specify the title, start date, end date, intro, full text, categories and links into the timeline. Add media like images and videos as and wherever required. Add events and categories to your timeline. These can be color coded differently in order to make it visually appealing and interactive. This timeline maker software provides customization options, that can be used to set timeline controls, lazy image loading, HTML formatting, slider customization, header customization, lightbox customization, font customization, etc. Using this timeline generator, a printout of the timeline can be generated or you can save it as PDF or CSV. Timeline is a simple timeline maker software that can be used to create timelines on Windows systems. Here you are provided with options to create Gregorian, Numeric, Directory, and Bosparanian timelines. Using this timeline software, you can add events and categories to a timeline. You can also choose to import events from some other timelines. Using Timeline software, you can add event properties specifying date, time, period, text, category, and container. Description, icon, alert, hyperlink, progress and default color option can be added to create descriptive timelines. Timeline can be saved as TIMELINE or ICS. Timeline software provides you with several export option, where you can choose to export timeline as CSV with events and categories, export current view of timeline to image, export whole timeline as image, export to listbox, and export to SVG. XMind is a simple software that can be used to create timeline. Here there are a number of timeline templates to choose from, that can be used to make a timeline. You can also add a number of elements that can be used to make your timeline self explanatory. Topics, subtopics, floating topic, floating central topic, callout, markers, images, relationship, boundary, summary, comment, taskinfo, etc. can be put to use while you create a timeline. Properties of different elements incorporated in a timeline can be changed, where you can choose to specify the color, text format, font, layout, background color, wallpaper, legend, etc. Markers can also be used to properly display the generated timeline. It can import data from FreeMind, Mindjet MindManager, and XMind 2008 Workbook. Several export options are available for Document, Gantt Chart, Image, Other Mind Map Format, Presentation, and Spread Sheet. Finally, a timeline can be saved as XMind Workbook. LibreOffice is a simple office suite that can also be used as a free Timeline Maker Software. It can create timeline in LibreOffice Writer, LibreOffice Impress, or LibreOffice Calc based on the timeline template format. 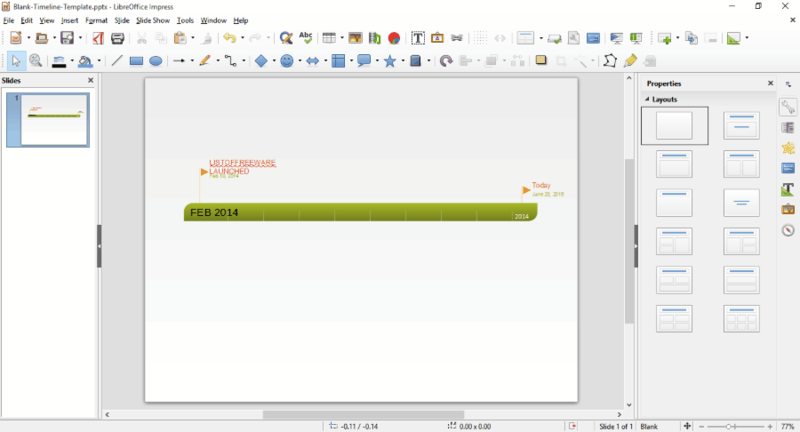 Download any beautiful timeline template and open it in LibreOffice. The templates to create timeline for Microsoft Office can be used here. Make some edits to the downloaded timeline templates, and make your own additions as well for milestone, timeband, etc. Add your own images, clipart, charts, table, etc. wherever possible. Finally, timeline created can be exported as PDF, ODT, DOC, PPT, PPTX, XLS, XLSX, XML, etc. OpenOffice is another simple office suite that can be used as a free timeline creator. This can be achieved by making use of timeline templates that are available for Microsoft Office. There are a number of free timeline templates available that can be put to use. Download a beautiful timeline template and open it in OpenOffice. Edit the template and enter your own information. You can choose to add images, charts, tables, cliparts, etc. in order to further beautify your timeline. Finally, timeline can be exported as PDF, XPS, DOC, XLS, ODT, PPT, DOCX, PPTX, etc.